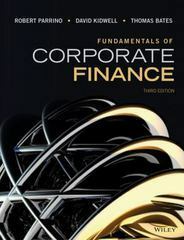 Fundamentals of Corporate Finance 3 Edition Fundamentals of Corporate Finance, 3rd Edition by Robert Parrino, David Kidwell, and Thomas Bates develops the fundamental concepts underlying corporate finance in an intuitive manner while maintaining a strong emphasis on developing computational skills. The authors believe that students who understand the intuition underlying the basic concepts of finance are better able to develop the critical judgments necessary to apply financial tools in real decision-making situations. The Third Edition offers a level of rigor that is appropriate for both business and finance majors and presents the content in a manner that all students find accessible and engaging.